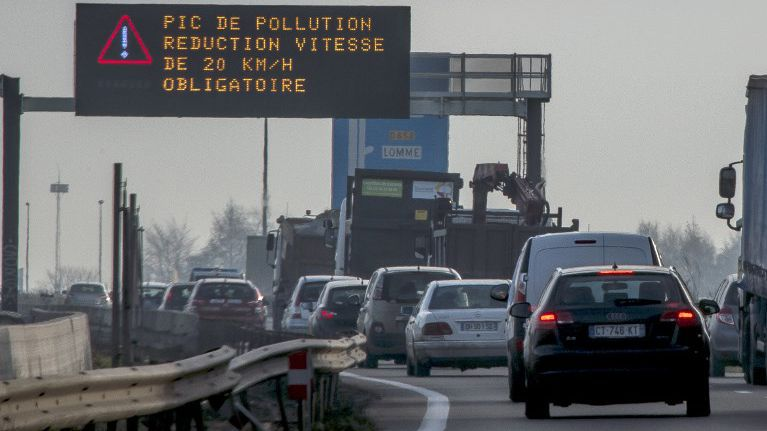 From time to time, the speed limit is reduced due to pollution in France (example (mirror)). Do these reductions apply to electric cars? I'm french and as far as I know, this is for all types of vehicles. The reduction of pollutant emissions is due to lower car consumption and a slow-moving traffic flow that avoids too much acceleration and braking (study). So I don't see why electric cars should be allowed to drive faster. Here's the thing. Slowing down traffic can actually make it run smoother. If people expect to go the higher speed, then any bit of open road is considered "lucky" and driving amounts to seizing any bit of luck to sprint to the next bit of congestion. This exacerbates the points of congestion. However if cars respond to open space by cruising at a somewhat reduced speed, the congestion ahead is more likely to clear. The WSJ article talks about a "sweet spot" at 45 mph/72 kph, density that clogs at 65 mph/105 kph will instead run smooth at 45/72. As far smog (HC/CO/NOx), smooth-cruising engines are much, much cleaner-running than engines doing a lot of "transient events" between different power levels and road speeds. It's very difficult for engine computers to manage transients because it has to play "catch-up" to what the driver is doing. (To hit the optional California NZLEV standards, automakers must remove the "catch-up" factor, with fly-by-wire accelerator pedals and computer-controlled transmission shifting. The computer inserts a small delay so it can now "anticipate" the transient and manage through it). Manual transmissions are much worse for transients (because the NZLEV trick is not possible) and manuals are very popular in Europe. As far as carbon (CO2/climate change gases), in this case that is not the primary concern, but CO2 emissions are proportional to fuel economy. Brakes are the worst enemy of fuel economy, steady cruise is better, and there's also an aerodynamic factor, with a sweet spot (coincidentally) about 70 kph or 45 mph. This paragraph applies to EVs as far as "fuel" economy, but the CO2 is emitted at the plant smokestack (in France, only true if they charge at peak, because France's base and shoulder generating capacity is nuclear). So there is very good science behind "slow for smog". Anyway, allowing EVs to cruise faster would throw a grenade into that first part, the one where denser traffic runs smoother if its "desire" speed is reduced. The EVs bolting in and out would cause congestion, which would make fuel cars make more smog. Yes, the speed limit applies to all cars. What measures can be taken? These measures apply progressively according to the evolution of the pollution peak. In case of restrictions based on air quality certificates, the prefect specifies the categories of vehicles prohibited from circulation and possible derogations. In any case, vehicles without an air quality certificate or whose air quality certificate corresponds to the most polluting categories are prohibited from driving. Road signs inform you if it has been decided to reduce the maximum authorized speeds or to divert traffic. For the other restrictive measures, information is obligatorily communicated in the media the day before, before 7pm. So if you can prove with an air quality certificate that your car is not polluting, it will not be concerned by the last category of driving restrictions. However, the other measures, including modification of speed limit, apply to all cars unless explicitly stated otherwise. These restrictions are local and don't always apply to all roads. Typically, the speed limit is reduced by 20 km/h on expressways. Which restriction over which period and which area might vary, you'll want to check the news for more information. That being said, I never heard electric vehicles being singled out of speed restrictions. In the absence of decisive proof, there are only two things you can do. The first is application of Occam's razor, making no assumptions, so unless noted otherwise the restriction applies to all vehicles everywhere. The second thing is, regardless of what the law allows, drive safely. Electric cars are a minority. Driving 20 km/h faster than all other vehicles, especially in dense traffic, is an accident waiting to happen. You risk nothing by driving slower like everybody else. Not the answer you're looking for? Browse other questions tagged france automobiles air-quality or ask your own question.